Geocel ADVANCED RV EPDM Roof Sealant is a premium one-component, proprietary sealant designed for the recreational vehicle industry. White EPDM, primed TPO, primed PVC, metal, other pre-fabricated sheet goods, and other common building substrates. The advanced technology results in a sealant that provides a durable fix for RV EPDM roof repairs without damaging or swelling the white EPDM membrane. Geocel ADVANCED Sealant has excellent expansion and contraction properties to withstand the joint movement and temperature changes associated with recreational vehicles. It bonds to many recreational vehicle materials, even damp surfaces. Do not use on unprimed TPO or PVC membranes. Do not use on black EPDM. Do not use in areas where food is processed or stored. Not suitable for potable water applications. Will not harm or swell white EPDM membrane. Quickly withstands exposure to the elements. 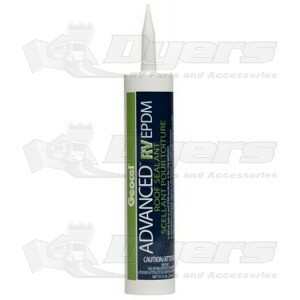 No additional adhesives or sealants needed. (1) 10 fl. oz. cartridge. I watched u-tube a few times to assist on how to prep the roof prior to applying. I spent close to a day prepping and then applied the product. Went on great. We've had a lot of rain and I haven't found a leak.